This is a great entry level recumbent bike to go with, perhaps the best one for this particular price range. Surprisingly enough, it comes with magnetic resistance, it has a fairly solid build, and it will do the trick just fine. For the price that it costs, you really could not expect anything more from it. 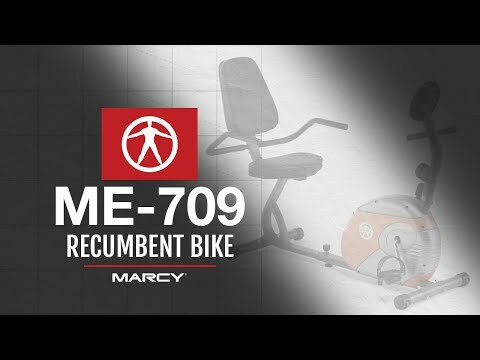 If you would like to find out a little bit more about the Marcy ME 709 Recumbent Exercise Bike, you can always check out the little presentation video below. When it comes to features, while the Marcy ME 709 Recumbent Exercise Bike does not have anything special like speakers or Bluetooth, it has more than enough juice to give you a fairly substantial cardio workout. In terms of its footprint, for an entry level recumbent bike, the Marcy ME 709 Recumbent Exercise Bike is fairly average. It does not fold down or anything, but it does not weigh too much, nor does it take up all that much space either. Unfortunately, the Marcy ME 709 Recumbent Exercise Bike does not come with a great warranty. It has a limited 2-year manufacturer’s warranty on the frame and parts. The Marcy ME 709 Recumbent Exercise Bike is very easy to assemble. There are not too many parts to put together, all of the tools and parts come included, and the instructions are fairly easy to follow. It should take one person no more than one hour to complete assembly. It does help to have a second person giving you a hand, or you can always choose to get expert in-home assembly for an extra $100. Here﻿ is the user manual which includes assembly instructions. There are a few things about the Marcy ME 709 Recumbent Exercise Bike that we really like, so what are they? One of the things that we really like about the Marcy ME 709 Recumbent Exercise Bike is that it is fairly space efficient and lightweight. While it is not the smallest of all recumbent bikes, it still won’t take up all that much space. Moreover, coming in at just over 60 pounds makes it fairly easy to assemble and to move around from one spot to another. This is made even easier thanks to the front wheels that let you roll the Marcy ME 709 Recumbent Exercise Bike around. Another thing that we really like about the Marcy ME 709 Recumbent Exercise Bike is that it uses magnetic resistance to provide you with a challenge. This is not something that we would usually expect from such an affordable entry level recumbent bike to feature. We love magnetic resistance because it is extremely smooth and quiet. Also, magnetic resistance goes through barely any wear and tear seeing as the components do not actually touch one another. There are 8 levels of resistance in total and they can be selected using the magnetic resistance adjustment knob. Another thing that we like about the Marcy ME 709 Recumbent Exercise Bike is that it has a pretty nice seat. It comes with a well-padded seat that is ergonomically designed to fit the shape of your back. The same thing can be said for the counterbalanced pedals which feature great grip as well as straps to keep your feet in place. The other thing that is nice about the Marcy ME 709 Recumbent Exercise Bike is that comes with a simple yet effective computer screen. It keeps track of RPM, distance, speed, and calories too. It may not be the most comprehensive monitoring system, but it certainly does the trick. There are a couple of things which definitely could be improved upon with the Marcy ME 709 Recumbent Exercise Bike, so what are they? We think that there could be more than 8 levels of resistance. While this is fine for beginners and intermediate cardio enthusiasts, it will not be sufficient for people with an advanced fitness level. To give you a bit of a point of comparison, let’s talk about a couple of other entry level alternatives to this model which you can consider buying. The overall function of both of these bikes is almost identical. They both have 8 levels of easy to adjust magnetic resistance, plus they both have a very basic display as well. The real difference between these two models is that the Sunny Health & Fitness SF-RB1117 Folding Recumbent Exercise Bike is much smaller, much lighter, and can even fold down for easy storage. On the other hand, the Marcy ME 709 Recumbent Bike does have a better frame, it can hold up more weight, and it is more stable too. This recumbent bike model by Ancheer is another good alternative to consider getting. It is actually a lot like the Sunny Health & Fitness model that we just discussed. The Ancheer Folding Recumbent Bike is quite a bit smaller and more space friendly than the Marcy ME 709, plus it can fold down for easy storage too. That being said, the Marcy ME 709 has a much higher weight capacity, it has a better frame, is more stable and less wobbly, and has a few more levels of resistance too. At the end of the day, the Marcy ME 709 Recumbent Exercise Bike is most likely the best entry level recumbent bike out there. It has a fairly stable build, a decent user weight capacity, a decent seat and pedals, and 8 levels of magnetic resistance. For the low price that you spend on this machine, it definitely brings quite a bit of value to the table.